The phone becomes much more responsive and appears faster in general. I think those people who feel the S7 isn't as responsive/fast as stock android should really have a play with these settings. Anyone have any experience with the above? Care to provide some comparisons with other phones like HTC 10 or Nexus 6? That's one of the things everyone suggests to turn off to make a phone feel snappier, but I do miss the animations, even if you set them to half the time. And other than a laggy edge notification panel (it takes over a second sometimes to turn the screen on and show the edge panel), I don't feel the phone is sluggish at all. But it's all about preferences. I've done this and honestly, I notice no difference. I used to with my old S5 but the S7 is so much faster I've not bothered. I just turned off my animations and like the increase in speed. I don't think I'll miss the animations. I put my husband's S5 in Dev mode the other day and disabled all of the animations. He hasn't complained about it but I felt the phone was getting a tad sluggish. I don't think he's noticed any difference. 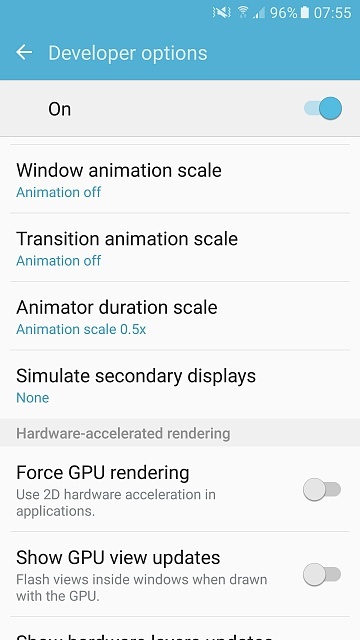 While I was at it, I went ahead and turned off all the animation on my S7. I don't miss it. I do it with all my phone's. I put them at .5 At full 1.0x it just annoys the hell out of me. I set everything to 0.5x on my previous S6 to help with the slight lag in scrolling for the chrome browser and a few other apps ( like the Android Central forums app). For my new S7, however, I've left these settings at there default values. I disabled an app and now my calendar is gone. How can i get it back? Why does my music play through my phone and headphone set ? i need to put an alert for my voicemail on my Samsung Galaxy 4 and don't know how? ?